Club Penguin Cheats by Mimo777 Club Penguin Cheats by Mimo777: Club Penguin Coins for Change Goal REACHED by Billybob! Club Penguin Coins for Change Goal REACHED by Billybob! 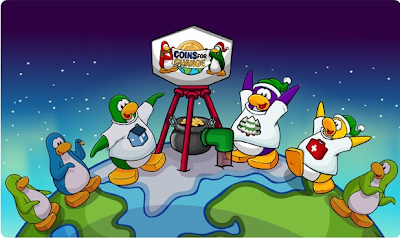 Welp, Club Penguin has announced they officially met their Coins for Change goal! Woot! So, to find out where the coins are going, Billybob said to check back on Saturday for a video! Billybob also wants to give all you awesome penguins a HUGE thank you for all your giving! Now, Club Penguin wants to know what we are going to do to celebrate? Hmm, any ideas? Play Power Puzzle to celebrate? YEAH WE ROCK! guys we did SO great wow so we should have a big SPAMPede to celebrate! I love that cp does that every year! i put in ALOT of coins (because i didnt have anything els to do with the :p) mimo how many coins did u put in??? i hope that they were all pritty close but if i had to chose, i would hope the envierment won. I'm sill glad that we filled up the lighthouse! we are awsome! We should have a fiesta party on Clubpenguin. We haven't had one 2007. I know this is off topic but did you notice there is a new wallpaper? It's about The Penguins That Time Forgot. Go check it out! P.S: Please give me credit! Lets do a STAMPede party to celebrate Mimo! Hey!!!!! Wheres that room that was with a huge tree.You could enter it by the town or plaza????? how do i send you a picture because i found an ultimate glitch???????????? mimo777 if u go on to unlock items online sign click on i have a book and in english it is spanish wat is happening ? I think the medical one should win, not the envirement. why are u asking, u think they are gonna look on this comments and choose? Mimo, why do you not have polls anymore? I really liked them! ----------------------------------------------------------------------Well idk how many coins he put in there but i put 8000 but then it stinks cuz i had to play bean counters forever to earn them back because that game is like the biggest coin giver ever!!!!!!! !Anyways but i think cp should give us all 100,000,000 coins(100 mill. )then throw us a party or give us a new room or somthing for all to enjoy cuz if they just give us coins then only members can spend them so if they do both then nonmembers can also enjoy as much as members(and plus i want that new room that mimo showed us a while back)!!!!!!!!! I think CP should celebrate by giving Coins For Change items to every penguin who donated via Penguin Mail. The SPAMPede party ideas are good though! mimo!! BREAKING NEWS!! the spinny furniture doesnt spin anymore!! Alright!!! We reached our goal!! To celbrate Im having a mini partty att winterland!! Meet me now and we can celebrate(and earn some stamps)! so meet at lighthouse on winterland and look for me! The partys starting right now! hope you can make it! it still looks decorated 4 christmas on the homepage. did u notice? plz credit me. we got 40 something people!! come and get the stamp! I LOVE your blog mimo!You can even check out mine if you want to by clicking my name!Thanks! One more thing!There was a glitch of when you go to the ice rink it says loading stadium.Wierd right? Hey the CP Homepage is still the holiday party homepage! Thank you for letting Mimo know, but Mimo has already posted about this. Mimo posts the field ops every week. Mimo, how about you have a party? Maybe they will open up the Community Center, since donating coins for change counts as a 'community project'.